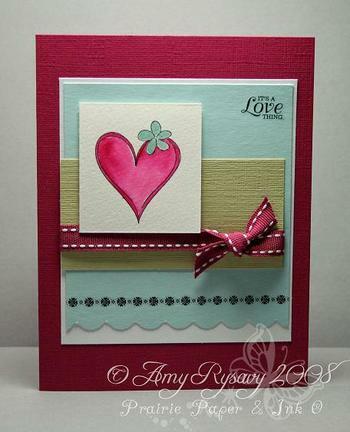 Seriously how FUN is CC Designs new Monkey Love stamp set?? I've had it sitting here for a while now and have made a couple of cards with it and enjoyed every second I had playing with these stamps. And today I can share one of the cards with you - and then thought how perfect the layout would be for another Friday Sketch - so here it is! The leaves were made with markers - just press down the sketch tip at an angle and voila! Instant leaves. 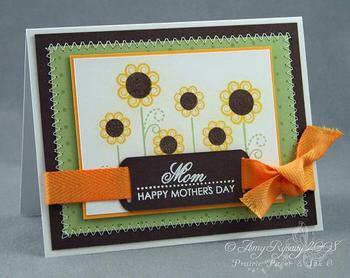 The rest of the card was super-quick - I used a piece of embossed paper from this DCWV paper pack, some Close to Cocoa and Soft Sky (Stampin' Up!) 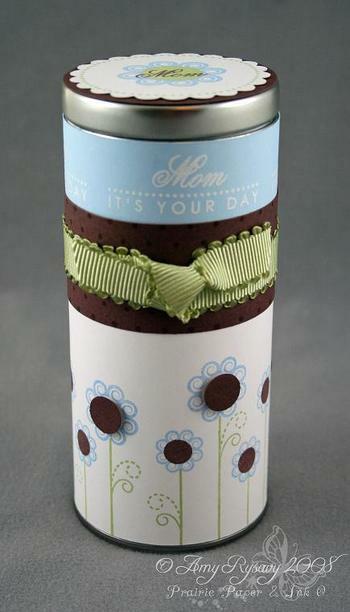 card stock, May Arts ribbon (LOVE this ribbon (when do I not love ribbon???) it ties beautifully - really soft and supple), and some DoodleBug Brads. If you upload your card using this sketch to any public galleries please use the keyword AMYRS17 to make it easier to find. One thing I REALLY enjoy doing is taking a few stamps (or in this case a set of stamps) and either a few sheets of patterned paper or a pack (like the Basic Gray Lily Kate 6x6 pack I used for these cards) along with a few matching embellishments and crank out as many cards as I can in one sitting. 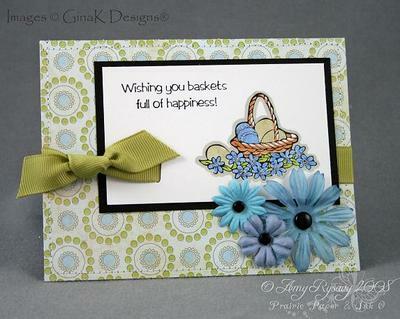 For the first card I stamped the basket from GinaK's Baskets of Happiness set then colored it in with Copic markers. 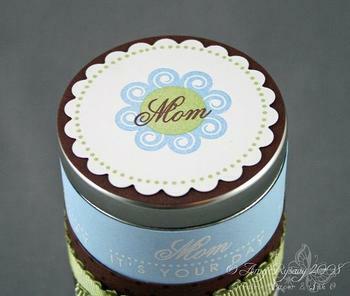 I then stamped the sentiment and punched a hole with my Making Memories Ribbon slot punch. 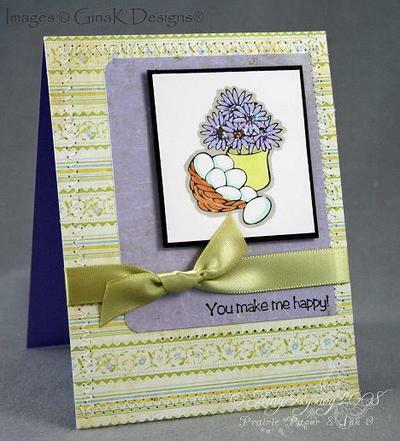 I used Baby Blue Stickles on the flowers and the egg for a little "bling", and added a few Prima flowers with black brads. The ribbon is the new Papertrey Spring Moss grosgrain (I am LOVING PT's new ribbons - seriously LOVING them). 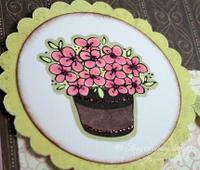 This card took on a completely different look as I pulled different colors from the paper pack then the previous card. Again I used Copic markers to color in the pot of flowers, then added a bit of Cinnamon Stickles to the flower centers and to the pot. The main image was punched out with my Marvy Mega Punch and matted with a Giga Scalloped circle. 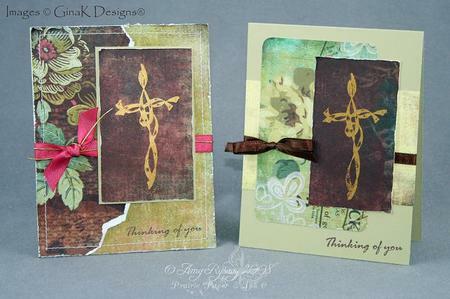 The rest of the card was quickly put together - I stamped the sentiment, added some ribbon (this time some Spring Moss Twill), adhered the patterned paper to the card base, then pierced the holes with my paper piercer before adding the main image with dimensionals. I made the third card using the last image from the Baskets of Happiness set - stamping it and coloring it in with Copic markers. You can see the slight sparkle on the flowers - I added Grape Ice Ice Stickles to them. The ribbon is yet again more Papertrey ribbon. I stitched around the edges of the card base again and added some holes under the sentiment with a paper piercer (kind of hard to tell with the pattern in the paper). OK ------ I finally have a chance to sit down and post! For those asking my first day of the gel nail course went good! The only practical I did was putting on tips and filing (I knew I wouldn't like tips but it was more the fact that it's so insanely time consuming - especially for me b/c I wanted them all to be perfect!) and now I have a bunch of studying and chapters to read and questions to answer before next week. Yesterday was Veronica's 5th birthday. I ended up throwing an impromptu birthday dinner for her with all her grandparents in attendance so I spent the day cleaning and cooking and got hardly any pictures but I'm hoping to take some of her with her birthday presents (which she's playing with right now and surprisingly the girls have been pretty well behaved all morning - of course with all the new things to play with they're kept nice and distracted *wink*). I used GinaK's new He is Risen! stamp set for all 4 of these cards, and stuck with Basic Grey's 6x6 Stella Ruby patterned paper. The cross was stamped onto the paper using The Essential Glue pad, then I brushed on Aztec Gold PearlEx - in real life they're quite shimmery and elegant looking. I used various ribbons, some gold brads, and Stampin' Up! 's Chocolate Chip and River Rock card stock on all of the cards to finish them off. I do have a question...what brand of ink do you use if Palette does not have the right color. Hi, I've seen your products... do you create something for wedding? Do you have a catalogue?? Well thank you! As you can see from the first question I have a LOT of inks - but for coloring with Prismacolor pencils I almost always use Palette Hybrid Noir ink. I have recently purchased some nestabilities and I am having problems (??) with the dies leaving marks on my cuttlebug spacers. Is this normal? I actually used a cuttlebug die this morning and it also left a mark on the spacer. Do you know if this is to be expected? What sandwich recipe do you use for the nestabilities? I really appreciate your insight. Yup that's normal. The plates will get REALLY marked up with regular use and in time they will break and need to be replaced (most places that sell CuttleBug Machines and accessories sell the replacement plates). I've had my Bug for well over a year now and I've only broken a couple of plates - the first one b/c it was HEAVILY used and time to go and the second time because I had my "sandwich" too thick and it couldn't stand the pressure. I use the sandwich recipe shown here. Hi Amy...I read on your blog that you have most of the SU punches. Does that include the picture corner punch? And if so do you use it much or prefer to do the corners as you do in your tutorial? It took me a while to figure out just which card you were talking about but then I remembered! The first one in this post right? Being a fellow Canadian, I was wondering if you had come across any postings for cards to be sent to our Canadian Troops. (There seems to be an unlimited amount of listings for the States, but I'm having trouble locating the canadian ones) We have a local senior's center that would like to make and forward cards to the troops. Your assistance would be greatly appreciated if you have any information you can pass on. Canadian Military Need Our Support! Does anyone have an address for Canadian Troops? Honestly I just eyeball it! 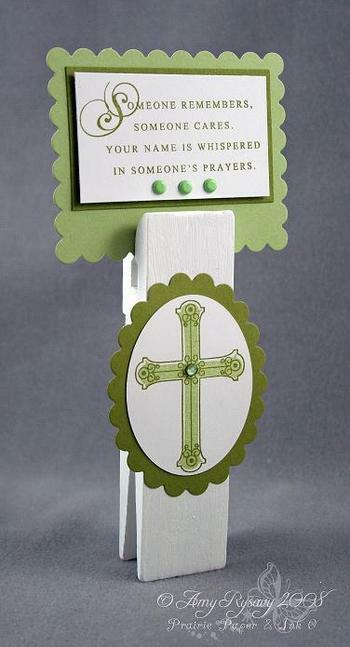 I use a paper-cutter of course (I have the Fiskars one that Stampin' Up! sells) but when it comes to matting and whatnot I rarely pay attention to measurements and just "look and cut". Of course that doesn't really help you out at all - what might is to #1 - get a good paper-cutter - and if you're not sure which one to get ask around! There are a LOT of options out there are some are definitely better than others. #2 - measure your cuts - if say you have a rectangle that's 2x3" and you want a nice mat - cut the mat 2 1/4 x 3 1/4" - that will give you a nice 1/8" mat around the main image. I was trying to find something on your blog that I thought I saw a few weeks ago. I can't figure out if there is a way to go backwards on your blog though. I think it was you who made something with one of those mailboxes from Target for $1? If there is a way to look it up, could you please let me know? First off you can get to all my older posts in my "Oldies But Goodies......" section - ll my posts are categorized by month and go all the way back to the beginning. Second I did do a couple of things with the mailboxes (not having a Target in Canada some VERY sweet ladies sent me a few of the boxes along with other goodies to play with - in fact I still have some of it sitting here waiting to be embellished and altered.....) - here's one of them. 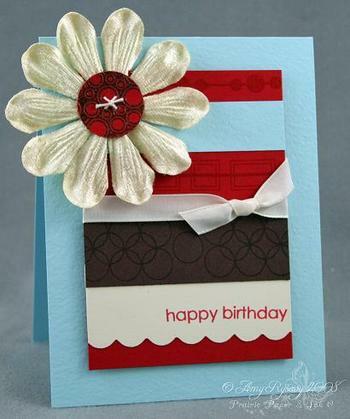 Love all the wonderful cards that you make. What about the inside? Do you always leave them blank for a handwritten message? I never know what to write so it doesn't sound so cheesy! Help! Yes a lot of the time I do leave the inside blank. Sometimes I stamp a nice sentiment on the inside, or I'll stamp some of the images used on the front on the inside to "carry the theme". I'll also adhere some of the patterned paper I've used on the outside on the INSIDE of the card as well (something I picked up from Cindy - loved that idea) just to dress it up a bit. 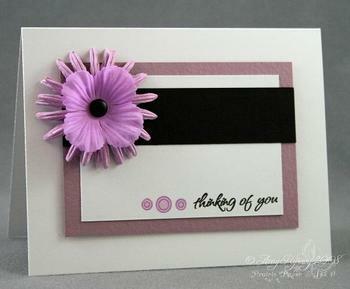 I wanted to ask you for any ideas on how to use the shiny white SU cardstock. I got a big basket gift full of papers embellishments etc and a whole pack of this shiny CS and I have no idea what can I do with it. I love your cards truly AWESOME do you know any place or coupons for discounts on copic markers???? I wish I did! So far I haven't come across anything like a discount or a sale on the Copics - if I do I will be sure to post! 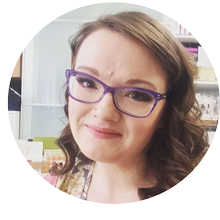 Several questions were posted on my February Papertrey Release Countdown post so I just finished editing the post and added the questions and my answers at the end of it - so if you asked a question or are just curious you can check them out here (scroll down past all the pictures to get to them). 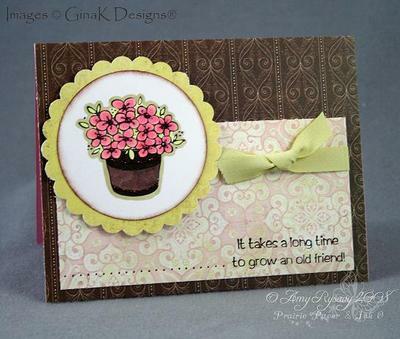 GinaK just finished posting a step-by-step tutorial (with pictures of each step!) 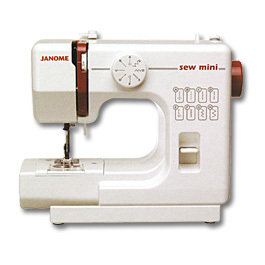 on how to use the Janome Sew Mini Sewing Machine. I am going to post liks to both parts of the tutorial (she split it into 2 parts) as I think it is the BEST and easiest way to figure out how to use it (it IS really easy to use - when I got mine it didn't take me long to figure it out and I have little to no sewing experience!). Janome Sewing Tutorial 4- Now we're sewing! Excellence Award and a Tag!! I was nominated 4 times! (how cool is that???) for the excellence award by Kelly , Jennifer, Kristine, and Niki - thanks girls!! 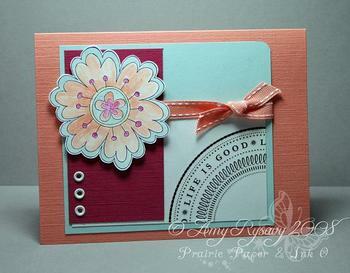 Stamping Style - eclectic - I find my style is always changing and I am drawn to and inspired by so many different things. For the past several months I've been in a much more "simple" style of stamping - and I really like it! Inspiration - EVERYWHERE! Magazines, websites, commercials, cataloges (Pier 1, Pottery Barn, IKEA etc etc etc - those ones have FABULOUS inspiration in them! 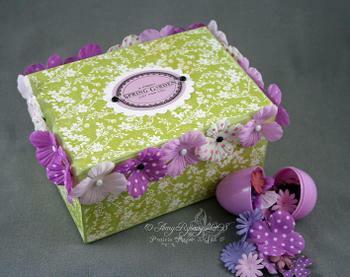 ), stamps, fabric, nature, etc etc etc! First Job - volunteer at a local roller-skating rink - I rang up purchases and played the music and whatnot. Ink - I have a LOT of ink. 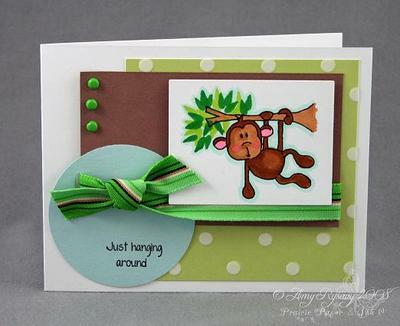 All of Stampin' Up! 's Classic and Craft Ink Pads, all of Palette's Ink pads (the cube size), VersaMagic Tear Drops, Brilliance Tear Drops, ColorBox Cat's Eye's in Chalk and Pigment Inks, and now Papertrey's new inks. Biggest Challenge - procrastinating - I still can't help putting everything off until the last minute! 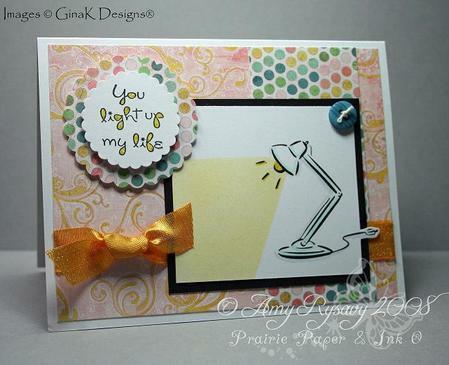 Here is a card I made the other day using Billboardabella and one of the sentiments that comes with the stamp. 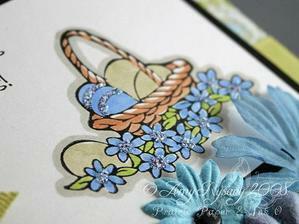 I stamped the image with Brilliance Graphite Black then colored it in with Copic markers. 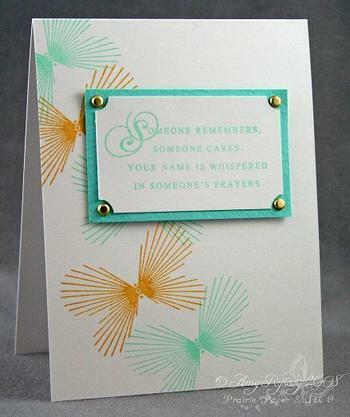 The patterned paper is by SEI (LOVE this collection - really bright and cheerful! 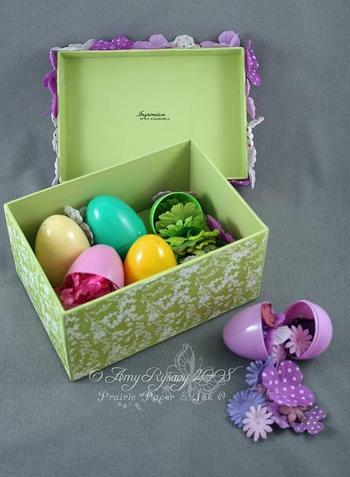 ), and the ribbon is May Arts. I finished off the card with a few Primas then scalloped the bottom of the card with my Corner Rounder punch (little video tutorial on that here). And a quick apology for not getting my Sunday Q&A post up yesterday - I will either get it up later this week or wait till next Sunday and do (probably a pretty long) one. It's "Family Day" here in Saskatchewan and so Tim has today off and we're just spending the day together with the girls. 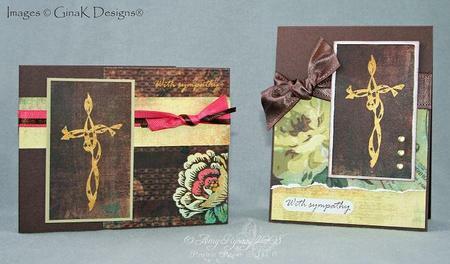 Here are all the samples I created for the February Papertrey release. 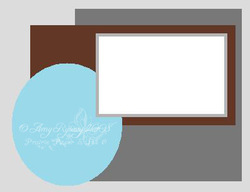 For all the supplies info you can check the PT gallery (FYI they are all listed by stamp set and when you click on them they are then listed by each designer's projects).